In a few years, Malmberget will no longer exist as it used to. It is a mining community under evacuation, which has long been characterised by movement. Before the iron ore was discovered, Sami people lived in and moved around this region. Much later, nightly vibrations spread from explosions in the mine through the ground into bodies and the foundations of houses. In the middle of Malmberget is The Pit – a massive hole caused by the mining operations that splits the community into two halves, and testifies to the conditions for its entire existence. – I don’t remember the air smelling this much of forest. The scent of the forest disappeared from memory faster than the perfumes we used in high school. CK One or Tommy Girl. Perhaps it was because the forest was always just there that I can’t remember a beginning or an end to its scent. The body effortlessly recalls all roads and shortcuts, but in Malmberget, many of them are disrupted by a fence that marks the areas in risk of collapse; areas that continuously expand to include more land. The fencing encloses the 200 metre deep and 21 acre large pit, which separates the eastern part of the town from its centre in the northwest. 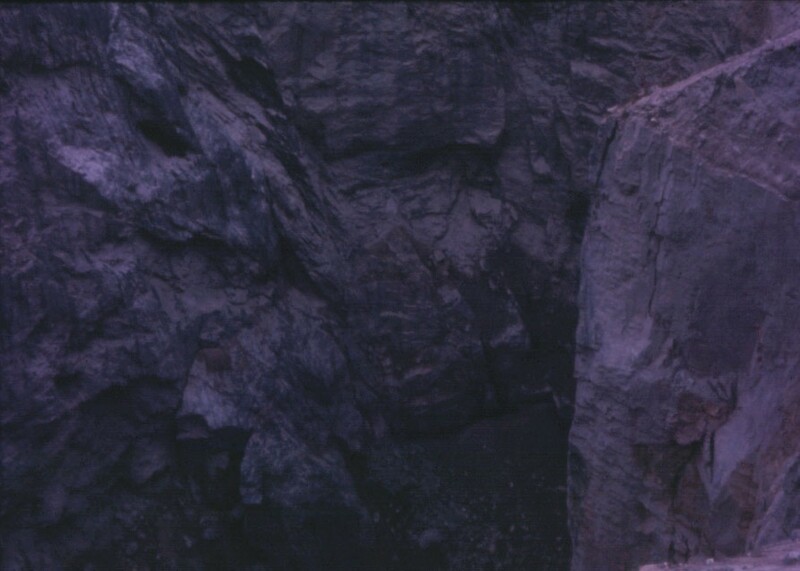 A huge hole, barely visible from ground level, just above one of the mountain's over 20 ore bodies. During the 17th century, long before the railroad reached Malmberget, Sami people discovered the first ore deposits, which were later mined in small quarries just north of The Pit and transported by ackja. When the mining community and the railway were established, people had to let go of the place that was before. Even those who stayed soon saw the transformations of the environments around them. In the mid-1900s large-scale mining begun with explosions underground. The cavities that occurred where the ore was extracted led the surrounding mountain to collapse into the voids. And slowly the voids moved closer to the face of earth. At the end of the 1960s, in order to avoid that masses of ground material would fall into the voids, LKAB started to remove the top 30-40 metres of soil in the area. On New Year's night in 1971, the field broke in and The Pit was a fact. In the book Post-Industrial Landscape Scars, the cultural geographer Anna Storm uses the scar as a metaphor to describe places that have been marked by different types of industries. Storm believes that Malmberget, which still has an active mining industry, differs from post-industrial societies where the industries have been shut down. The difference is time: the landscape's contradictory healing processes, and continuous changeability. Due to its specific circumstances, the location does not only represent the past, although prospects for the future are uncertain. Storm writes: "The situation is liminal, like a scab, vulnerable and easily turned into a wound once more." It takes more time for a wound to heal when everything around it keeps moving. Much of what I think I remember shifts as I move around the town. High up on the mountain, among the old wooden houses in the area called Kilen, I have to find someone to ask how to get to the centre of Malmberget. The streets and paths are not the same as before. The scab is itching. But it's not just me who’s different – that misremembers and no longer is able to recognise myself or the places around me – the landscape also testifies to a long and ongoing transformation. In this similarity between us, I find comfort. It's as if it doesn’t really matter, what I, up until this point, believed to understand and remember about Malmberget or my relation to it. The darkvoid in the landscape liberates and makes room for fragmentary stories of what has been and what may come. Chronology glows in its absence, but I get the feeling that it's okay. I have not come here to write history. In the actor, playwright and director Mattias Fransson's radio series The boy who never stopped digging  (2016) a hole in the ground contains utopian potentials. The series takes place in a small village in Västerbotten. One day when 9-year-old Johan runs through the woods, he finds a shovel leaning against a tree. He grabs it, and starts digging. Hours, days, months go by and Johan continues to dig. – Stop digging now, Johan! After a while, more and more people join the excavation. In less than a year, one of the shops in the village sells over 700 shovels. – It felt better when we were digging, you see. Everyone had the same goal; everyone wanted to achieve something. The hole in the forest gets deeper, and in the end some of the people who have been digging decide to make a settlement inside it. They inaugurate a public square and open shops, a health clinic and a pizzeria. It takes half a day, it is said, to get to the bottom of the pit. At its edge, hundreds of metres above, is a point of assemblage for people still living in the village. The hole has a magnetic pull. – I'm here to try and find, well ... Find answers and, you know, when you look down here you get in touch with something ... Something infinite. In Malmberget, The Pit has swallowed parts of the town as it used to be. I thought I came here to regain something I had lost, or maybe forgotten, but it turns out I've come here to dig. In the centre, like most other restaurants and shops, Danne’s Street Kitchen is empty. The 11-storey apartment building Focushuset, where my grandparents lived for a few years, is dilapidated but beautiful. All stairwells that smell of old cigarette smoke, for me, are this exact stairwell. All cigarettes smoked are those of my grandfather, even though he stopped smoking a long time ago, and is no longer even alive. The cracked asphalt roads that continue in the enclosure behind the fence end abruptly at the edge of The Pit. Perhaps those who have lived in Malmberget their whole lives have been driven to accept the malleability of the place aswell as their memory of it. 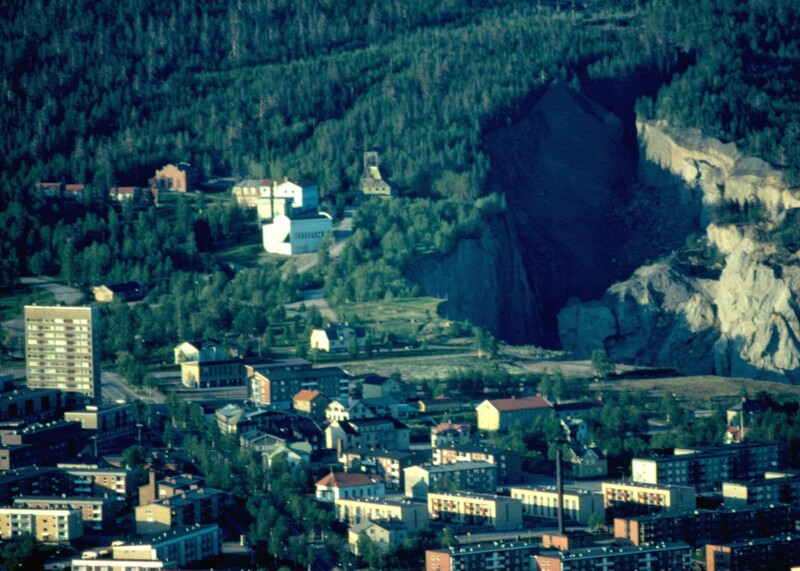 Storm believes that LKAB's evident dominance over the town has resulted in a lack of articulated and shared views among the population. Instability is a part of everything. It echoes in the conversations. It is one with the anger, hope, even, and especially, the ground itself. *“In a way, it’s like Mother Earth. You open up the ground. It's almost like after a difficult childbirth. Mother Earth is defiled and then stripped of her valuables. Then the mother is left behind to die, maybe. Then the ore comes out into the world. The iron is useful to a lot of people, but bad things are made of iron as well. Weapons and ammunition, for example. The evacuation plan is extensive as new areas and replacement housing need to be built. Since 2012, more people have been evacuated, but many still remain in Malmberget. Within a couple of years, the neighbourhood of my childhood home will be behind the fence. For other areas, it will take longer. From the street, I can see that the roller blinds in my parents' old bedroom are still there. It's almost as if a someone not from here has come to tell me how to react to the fact that soon my childhood home will be no more. Though I did not realise it at the time, I now know that our home started disappearing already as we moved away, becoming more and more estranged as time went by. The time has come to replace that roller blind. As I cycle away, I think about the big silver birch that stands outside the window of the room that used to be mine, and hope that it will make it through all of this. A few days later I'm in the car in Luleå, about 250 kilometres from Malmberget. Outside the window is SSAB's steelworks where the ore extracted in, among other places, Malmberget is transported by train. I’m reminded of what Marie Ridderström said of the different uses of iron. Germany has long been one of Sweden's greatest iron ore trade partners. During the Second World War, 25 percent of the raw iron supply in Germany came from Sweden. At the end of the 1930s, most of the exports went there. Because Swedish ore also has an especially high iron content, the German steelworks could save on labour as well as power in the blast furnaces. It was from the port of Luleå that the ore was transported to Germany. The transport even took place from the other end of the railway, in Narvik in Nazi-occupied Norway. Many protested against the Swedish trains, which, during the war, were freighted with German military and iron ore. However, in spite of these protests from the allied countries as well as other parties, Sweden continued to export steel to Germany throughout the war. Steel that strengthened German warfare, and as such impacted the war as a whole. My brother says that the lake next to the steelworks is always around 20 degrees. It is said that the fish that live there grow faster than fish elsewhere in the area. Dad says that when he used to work on the ore transportation trains, if he put his hand against the window, he could feel the heat from the steelworks. I remember when I went in the train with him from Luleå to Gällivare, how the only trace left of the reindeer that had been run over on the way down were meat scraps and blood stains in the snow. When spring came, the snow melted. I dig, without knowing exactly what I'm looking for, but I'm getting closer. Malmberget lives in the body, and the wound that itches is not only in the land, but also on the surface of the skin. In 2001, LKAB had the idea to refill The Pit and heal the traces and wounds left on the landscape by the mining industry. But the logistics were difficult and the dust from falling rocks and boulders that were dumped into the hole spread like a blanket over the whole town. Everything got dirty and, over time, as one side of the wound was aided, the other began to grow worse. It was as if nature refused to cover up the violence that had been inflicted on it. In 2009, LKAB discontinued the project. The hole, simply, could not be filled. An ackja is a Sami sleigh drawn by reindeer. Storm, Anna, Post-industrial landscape scars [Electronic resource], New York, New York, 2014, p. 154. The boy who never stopped digging is available to listen to in Swedish on the website of Swedish Radio. Johansson, Karin, Vid kanten av Gropen: människors upplevelser av att bo i Malmberget idag : en nutidsdokumentation [At the edge of The Pit: People's experiences of living in Malmberget today], Gällivare kommuns folkbibl., Malmberget, 1995, p. 12.